UPDATE: Enjoy this Valentine’s Day project for the kitchen at our former home. We’ve moved and are giving our new-to-us home a complete remodel. I’ve completely changed my style! Click HERE to take a look. My granddaughters get so excited when any holiday rolls around – especially if it’s one that involves candy. My youngest, Miss K, is 5 and has just begun to grasp the concept of time in the last few months. It’s a little hard to explain to her how far away February 14th is, so I made a countdown calendar to help her count down the number of days. 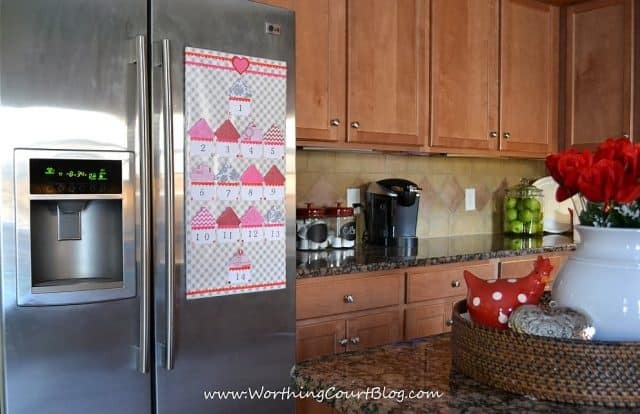 The calendar is mounted on the front of the refrigerator using Command Velcro Strips. One piece of white foam core board. I bought mine at the Dollar Tree. Embellishments for the pockets. I used some ribbon tape and mini heart stickers that I found at Target. 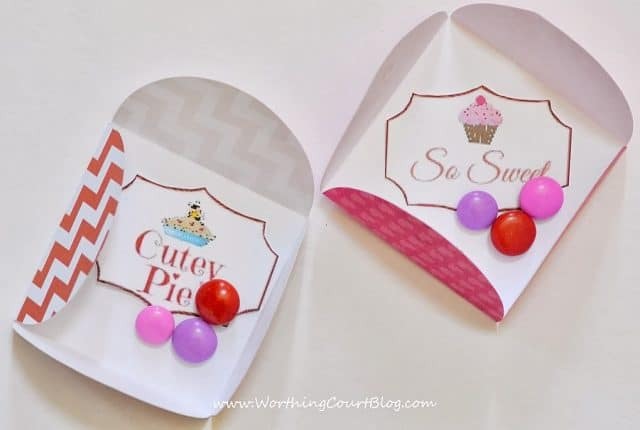 Mini Valentine’s containing a note from the free printable and a few M & M’s. Click HERE to find out how to make them. 1) Begin by determining the dimensions that you want your finished calendar to be. Cut the foam core board to that size. 2) Wrap the wrapping paper around the foam core board – just like wrapping a present – and secure on the back side with clear adhesive tape. 3) Cut 14 pockets, for the mini Valentine’s to fit into, out of the white cardstock. The size of the pockets will be determined by the size of your board and what pocket arrangement you use. Just make sure they are large enough for the mini Valentine’s to tuck into. If I remember correctly, my pockets were 3″ wide x 2.5″ tall. 4) Embellish each pocket with whatever you desire before applying them to the foam core board. In my case I glued some scalloped paper ribbon along the top of each pocket, Half of them are red and half are pink. 5) Apply the pockets to the wrapped foam core board by running glue from the glue stick along the edges. 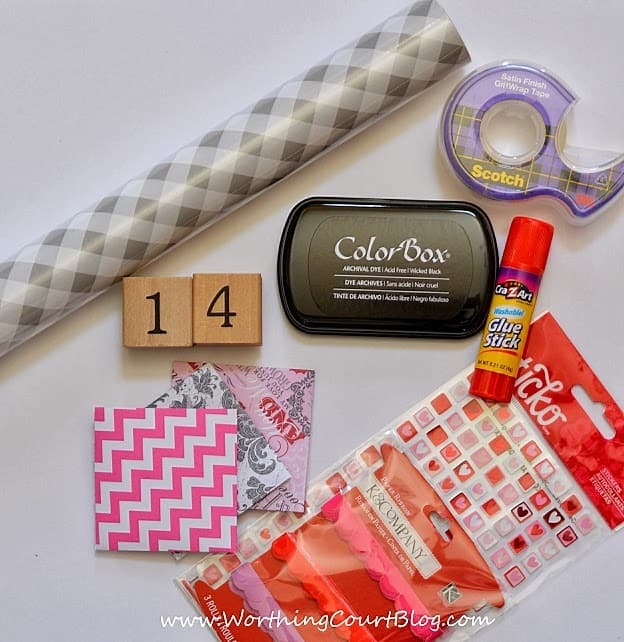 6)Using the number stamps, stamp each pocket with the date. 7) They don’t show up very well in the photos, but I added tiny heart stickers to the lower corners of each pocket after the pockets had been applied to the board. 8) Add additional embellishments to the board. I added more scalloped tape to both the top and bottom of my board and layered two heart cutouts over the tape at the top. 9) Turn the board over to the wrong side and apply a Command Velcro Strip to each corner. 10) Hang the calendar and then tuck the mini Valentine(s) into each pocket. As I was writing this post, it occurred to me that I really should have shared this with you prior to the beginning of February. Oh well…it still isn’t too late to make one, plus you can always pin the idea for next year! Click HERE to find out how to make the Mini Valentine’s. It includes a free printable with a whole sheet full of cute mini love messages. 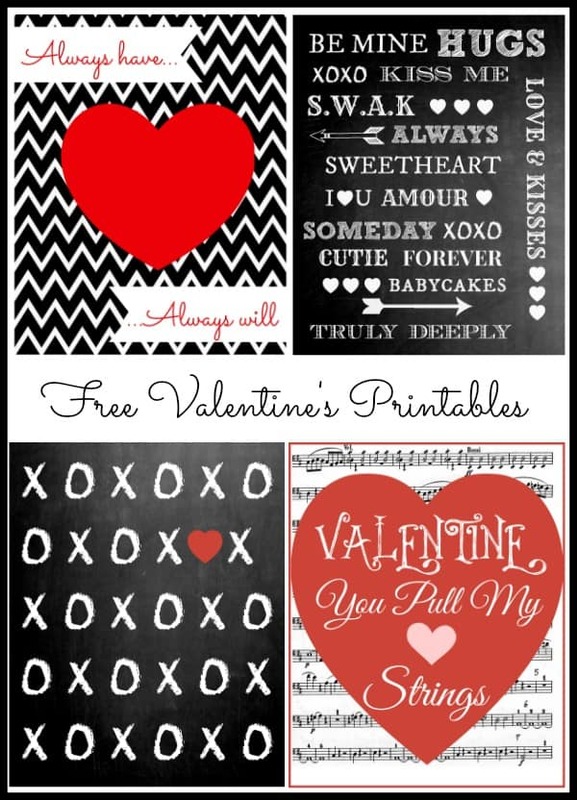 Speaking of printables, click HERE for four free, 8 x 10 printables for you to print and frame and add to your Valentine’s decor. You can download and print all 4 or just one of them. I’ll bet your granddaughters can’t wait to come to your house to open their card for each day. 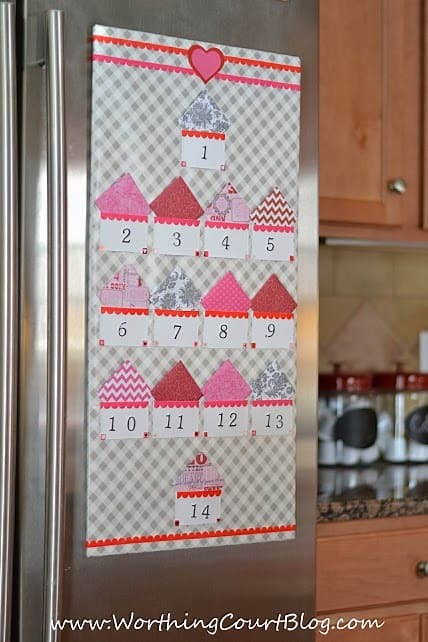 This is such a cute idea and a great way to create excitement for a holiday and to work on on counting skills for the youngest. I was wondering what that thing was on my refrigerator. Now I know. This is so cute, Suzy! Love that it’s on your refrigerator, too! Your granddaughters are so blessed by your presence and love in their lives. Suzy this is such a cute idea! Wish I had this when my daughter was small,although I could still make one.Thanks for sharing! I am thrilled to be a part of The scoops tour! Suzy, your granddaughter is one very blessed little girl! She must love her Valentine’s Day countdown! It is so so cute!!!! I think your mini notes are a fabulous idea. You are one bundle of creativity, my friend! Thanks for sharing it all with us! Awe, now this is just too cute! First of all, I so wish I had grandchildren…so ready for them!!! When I do, I’m saving this for craft day. Must be so much fun – lots of smiles and laughter. Beautiful project, wonderful Valentine Tour post! This is so adorable Suzy!! Love the idea, way cool!! Thanks for all the hard work on helping put tis tour together. Your Valentine Countdown Calendar is absolutely adorable. This is such a cute idea! I love how you can place it anywhere like a fridge because I’m running out of wall space! Such a clever idea– and I love it on the fridge! Happy to be on the Valentine Home Tour with you. Such a cute idea, Suzy!! Suzy..what a grand way to make the holiday special! Great touring with you!